Optional extras include: separate enclosures/compartments for fibre optic cable terminations, anti-condensation heaters, air purging and IP68 underwater versions. CEX HVJB series of enclosures are based on the heavy duty CEX design, which over many years has proved to be a reliable enclosure. CEX HVJB enclosures are often specified by engineers and designers when their project or installation requires a robust enclosure that will withstand harsh environmental elements and temperature extremes, which affords minimal post installation intervention and maintenance. CEX HVJB enclosures were purposefully designed to meet these demands and can be found on oil and gas installations and other hazardous sites worldwide. CEX HVJBs are available in various sizes (see table below) with up to 8 incoming and outgoing cables with a maximum 800 mm² cable size. CEX HVJBs are approved to 11Kv for Zone 1 and 15Kv for Zone 2. Typical applications include: all types of power generation, on/off shore Oil & Gas power and umbilicals (uncluding hydraulics, and datacoms) and on/off shore wind farms. Bespoke sizes and designs are available on request. 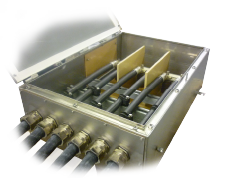 Optional extras include: separate enclosures/compartments for fibre optic cable terminations, anti-condensation heaters, air purging and IP68 underwater versions. Available with ATEX 2014/34/EU Directive Ex e, Ex nA certification and a temperature classification of T4 to T6.